You are able to purchase a class pass, or register month to month. Please note that themed yoga classes are typically a month long. One month of tuition is the same as one month of dance tuition. All monthly tuition payments are due on the 1st of the month, and monthly tuition payments are automatically charged to a debit or credit card on file. Please note denied/expired cards will be charged a $25.00 fee. If your tuition is not paid by the 5th of the month a $35 fee will be added to your invoice. Students will not be allowed in class if their tuition is not paid in full, by the 15th of the month. Accounts more than 60 days past due, may be submitted to collection services. 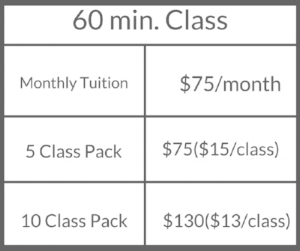 Each monthly payment is the same regardless of missed classes, cancellations, and holidays. Refunds (no exceptions) will not be issued for missed classes or holidays. If possible, a make up class (for those enrolled in monthly tuition) is suggested (see make-up class policies below). *If a class is missed due to illness, family emergency, etc. please call the office to reschedule a time to make-up the missed class. We appreciate if you are able to inform FMDC as soon as possible, if your child is not going to be able to attend the regularly scheduled class time. Keep in mind, if your child misses classes on a regular basis this will inhibit your child to gain the knowledge needed to proceed to the next level. No refunds are given for missed classes.